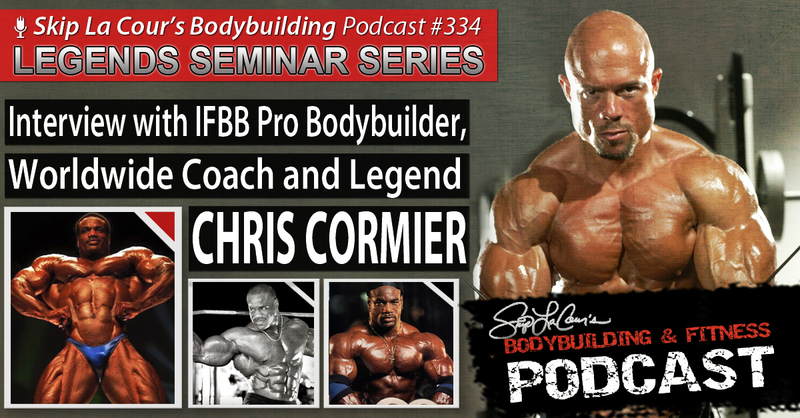 IFBB Professional Bodybuilder Chris Cormier talks about his long and successful journey to the top of the pro ranks in depth and with passion. Cormier reminisces about what many consider to be the competitive era of bodybuilding, the 90s. During this podcast, he reveals the detailed strategy that he executed to create his amazingly balanced, muscular, and well-conditioned physique. The winner of 12 professional bodybuilding shows talks fondly about the mentors he had the privilege to work with as a teenager and the legendary pros and friends he trained side-by-side with such as Shawn Ray, Flex Wheeler, and others during his career. Chris also shares his greatest memories of Lee Haney, Rich Gaspari, and Mike Christian who are the other legends he will share the stage with during an upcoming seminar in Santa Clara, California on June 26th and 27th. The “Real Deal” also discusses his obsession with helping others succeed in every aspect of bodybuilding and fitness and at every level. You’ll learn if you are a good fit for his Warrior Challenge and other professional physique transformation services.